As Alexander Theroux says, yellow, for all its dramatic un-alterability, is a color with thousands of meanings - light and spirit to illness and bananas. Wallace Stevens said yellow was the “first color” while he also suggests its’ association to decay and dissolution, and an affirmation that it is the color of sun. I found myself recently under a brilliant blue tent eating a juicy yellow/orange peach. When I returned back to my studio, I immediately decided to build a version of my ongoing graphite line drawings in space, in yellow. It only seemed to make sense. Luminosity was connected. Raume, from the original German word rumi, really does not have a satisfactory translation into English. It could be Chamber, a primary medium of architecture; Volume, a length, width and height set in a wide expansion; Space, physical space as a container of all things, Universe, a not rigidly limited physical expansion, or Area, a philosophical form of intuition. This raume yellow is both a volume of raume and passage through raume. Using just a single material, Egyptian cotton thread, the other major elements in this work are staples and tension. With this taut horizontal passage of tens of thousands of lines, I am seeking a raw mysterious form that greets us as an abstraction - optical and immaterial. The structure and body of raume yellow is really quite simple, yet its associations and visceral cues are complex. I am interested in an indeterminate state and therefore also an intangibility. 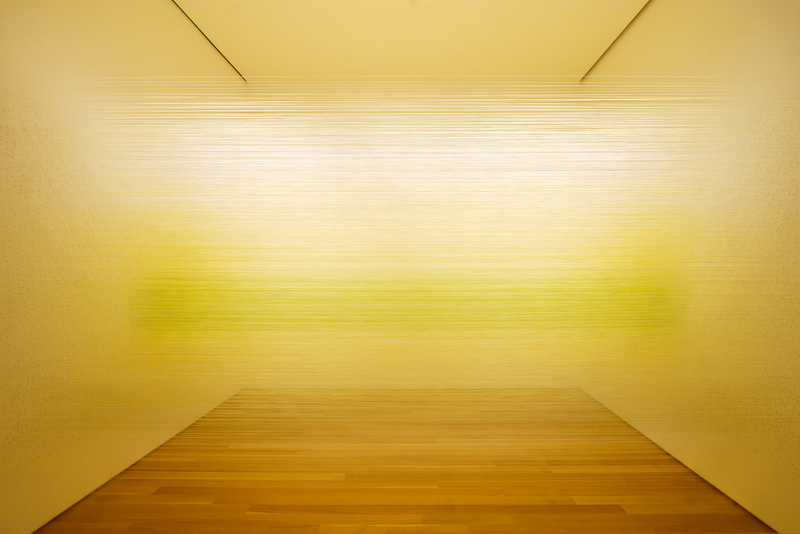 In making this work, my curiosity gravitated toward conditions and phenomena of architecture, light, optics, body, tactility, textile, and space as well as the myriad associative symbolism of the color yellow. The internal structure of this form is difficult to comprehend and collect at any given moment or vantage point. I’m intrigued that the lines appear suspended, and difficult to grasp, as if drawn by light in an effortlessness that does not speak to the process. This work is indexical of my graphite drawings yet without the connection to hand-making. It’s almost as if it is a natural phenomenon. 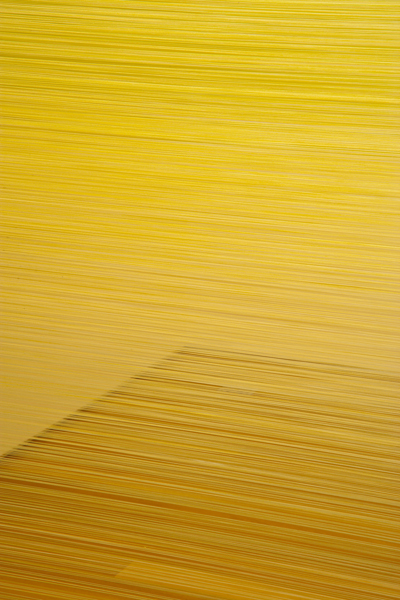 raume yellow is a drawing in space and a collection of marks & shadows on the wall. I frequently return, in all of my work, to the subtle distinction between drawing as noun and verb as a long held focus in my studio practice. This blurred distinction drives my fascination with an expanded definition of drawing languages and the resurgence of drawing in contemporary art. My collective body of work is an iteration of this language - a reassertion of the age-old desire to understand self in place.